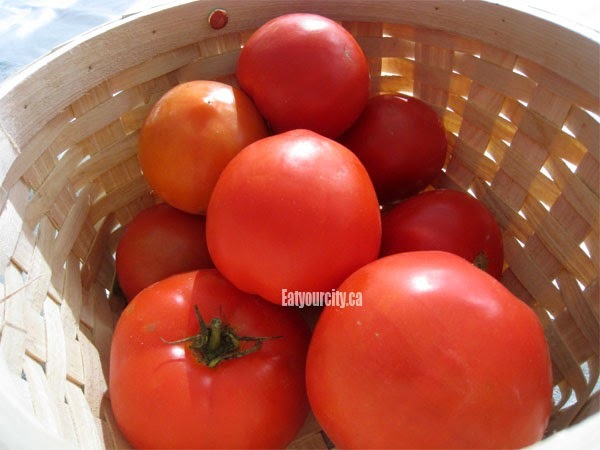 Eat Your City: Handmade ricotta gnocchi recipe - fluffy, light, cheesey goodness! 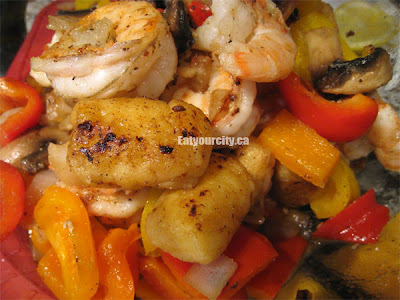 And panfried shrimp ricotta gnocchi! Handmade ricotta gnocchi recipe - fluffy, light, cheesey goodness! And panfried shrimp ricotta gnocchi! Posted by A big tub of ricotta was staring at me from my fridge. It was leftover from making a big pan of lasagna for a girlfriend get together. Leftover as in I bought way too much and this brand new HUGE container of ricotta was challenging me to do something with it. With homemade ricotta, I'd just be eating it spread on crostinis and flavored olive oil... but with the store bought stuff that always has a much rougher texture, I usually like to cook or bake it. How to use up a kilogram (thats 2.2lbs for those on the imperial system) of ricotta? It sneered at me. 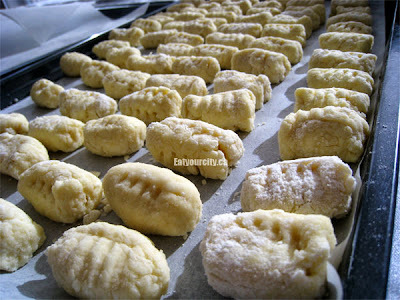 Then I grinned evilly back at it: you are going to be made into gnocchi! I usually make time and labor intensive potato based gnocchi, but I figured to do anything with 1kg of ricotta, well, gotta put some time into it - if nothing else, its the sheer volume that will take me the longest... and I got plenty of friends who would love to have some! After looking up a couple of recipes online, I combined a few techniques, and threw my own spin (I'm lazy so I devised some shortcuts) and off we go! 1) One of the most important things while making gnocchi - its just like making a really heavenly fluffy scone or soft tender cinnamon bun dough - handle it as little as humanly possible. The more you touch, prod, poke, roll the damn dough, the more gluten develops and the tougher, denser, hard as a rock qualities your gnocchi will gain. Less touchy feely = happy light as air gnocchi! 2) To save myself lots of clean up time after, I hand rolled out/portioned out my dough on a floured non-stick cookie sheet - all I had to do was toss it in the dishwasher rather than laboriously scrape all the random bits of dried dough and flour from the counter. I experimented to see if rolling out the dough into tubes and then cutting into bite sized pieces vs pinching off 3/4 inch balls of dough and handshaping or scooping out a level-ish tablespoon of dough and then rolling was faster.. I found just pinching off and hand shaping was faster, but to each their own. 5)Lightly dust your hands with flour and that should be all you need to firm up the gnocchi you're forming with your hands. 6))Gently rolling a fork over them not only gives it a classic look to the non-uniform bites of goodness, but it serves to act as pockets to absorb more sauce, herbs and flavors you're going to cook them up in later. I made a saucy version as well as a pan fried version to see which method the gnocchi would stand up better to - potato version ones do great in either and I wanted to see if there was a difference with ricotta based gnocchi. 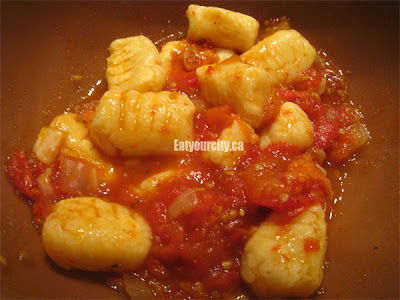 In the saucy version, I boiled the completed gnocchi in boiling salted water till they floated, then added to a roasted tomato and basil sauce - I found this particular gnocchi was a bit too dense and the cooking method really accentuated the coarse mouthfeel of store bought ricotta. If I ever am crazy enough to make a lot of homemade smooth ricotta and gnocchi the same day, the results would probably be different. Ricotta 1: me zero. When panfried for a few min in garlic, olive oil, a touch of butter and shallots, these babies were amazing! They were deceivingly light and fluffy with the delicate ricotta flavor shining out, and it was all too easy to overeat too many of them. Since I had placed all the gnocchi on parchment paper lined cookie sheets as I made them, it was a cinch to pop them into the freezer and then ziplock bag them to give away! 1) Either drain the ricotta over the sink in a strainer/colander for 30-60min or with a cheesecloth folded up 4 times, place about 1 cup of ricotta at a time into it, wrap it up and squeeze until you have 1/2 the volume of cheese. 6) Set finished gnocchi filled cookie sheets into fridge until you're going to cook them (max 2d) or pop into freezer for a few hours to harden up and then portion them into ziplock bags for later. 2) Turn down the heat to med-high, and add in the remaining oil, butter, garlic, onions and gnocchi. Saute for 4-5min, until the onions are translucent, and the gnocchi is lightly browned all over. Salt and pepper to taste. 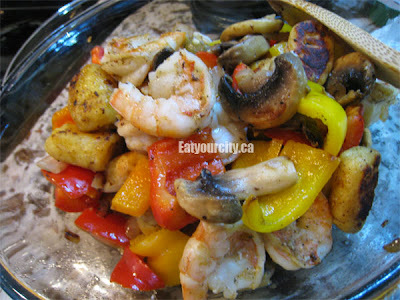 3) Plate with the cooked prawns and garnish with basil.